Single rooms have several options when it comes to heating and cooling. There are short term cheap options which are expensive to use and long term more expensive options which are cheap to run. Which heating cooling unit that is used will vary from one person to another since budget and other considerations must always be taken into account. So what are the best units for heating and cooling one room? With the many options available let break down each to see which one fits your scenario. Best Ways to Heat and Cool Single a Room. A heat pump is the best way to heat and cool a single room as far as running cost and long term duration go. Heat pumps use electricity to circulate refrigerant the same as any air conditioning unit does. When it becomes cold outside the cycle is reversed to put out heat warming up a room. Heat pumps are cheap to run and last many years. The downside to a heat pump is the initial cost to purchase which can be 2-3 times higher than other options. The two main heat pump units for a one room space it the window unit and the mini split unit. A window unit is the easiest to install since all the components are packaged into a single assembly. Window Heat Pump Unit On Amazon. If you are looking for the combination of a heat pump efficiency and ease of installation than a window heat pump unit may be the best option. 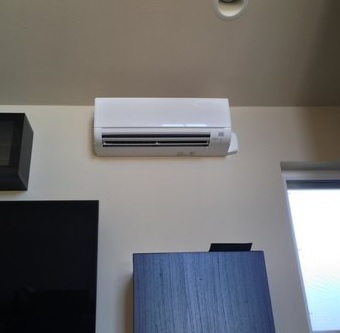 Most units are affordable about twice that of a air conditioning only model. This is the best long term solution that also has cheap operating cost. Mini splits have separate the indoor and outdoor coils the has cooper lines feeding refrigerant between them. The copper lines transfer heat and cold into room depending on the setting. The downside to a mini split system is initial cost and installation. Mini split units cost 3-5 times more than other units. Installation cost also need to be considered as they do require more skill to install. If you are a home DIYer than there are units that can be bought that come with everything needed to install it. Mini Split Heat Pump On Amazon. Most known about window air conditioning units and they can be used for cooling a room. They are cheap an relatively easy to install. The downside to them is that they only cool and are not very efficient. Since they only cool they will not do any good in the winter, a heat source will also be needed to keep a room warm when it is cold. Space heaters are cheap to buy but costly to run. The way they generate heat, usually by heating up a ceramic element combined with a fan, is terribly inefficient. Since the initial cost of a space heater is low this may be good option for a room that only needs heat once in a while. If you need a long term heating solution for a room than a heat pump would be much better. Since there are many options to heating and cooling a single room the initial cost and long term running cost need to be taken into account. Where the room is located will also be a factor. For example a room addition that is attached to a home will be easier to heat and cool then one that is separate.